Choosing colors is always a matter of taste and perception. The shades you choose say more about your personality than anything else. Take a moment to peruse this section of our site to find out which colors are best for you. Pale, dark, complementary, contrasting... the possibilities are beautifully endless. 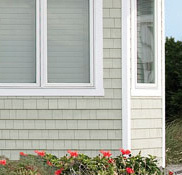 On wood siding from Maibec, the stain is factory-coated on all sides of the product in a controlled environment for a guaranteed uniform finish and enhanced protection against sun and weather damage. The Nautilia inspirations bring together soft blues, whites and grays that are reminiscent of ocean breezes and sun-kissed beach homes. 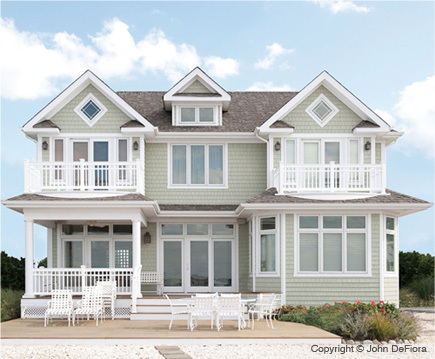 This inviting beach home features gray cedar shingles enhanced with white trim to create a look that’s effortlessly elegant, yet informal. The provincia inspirations feature pale shades—such as whites, yellows and creams—ideal for reflecting light and emphasizing your home’s lustre within its natural surroundings. 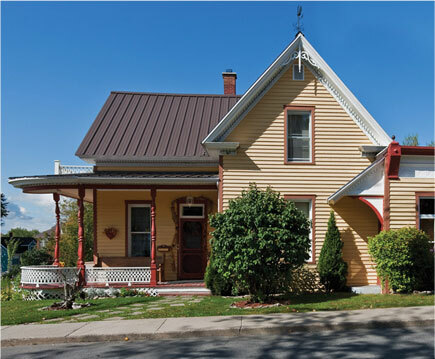 The charm of this ancestral home is enhanced by the contrasts created by the traditional profile of the mouldings on the rabbeted bevel siding. The terra inspirations feature soothing shades of brown, ochre and grey that blend beautifully with surrounding woodlands. 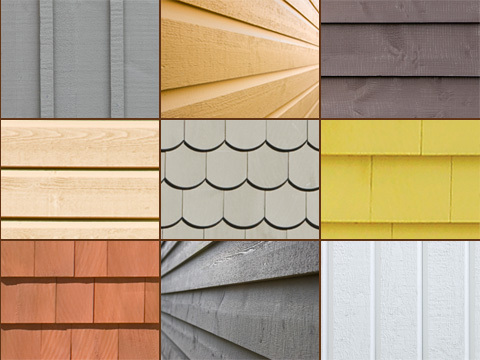 Nothing enhances the inviting character of a home’s facade or backyard like the use of coordinating siding, shingles and bold colors. 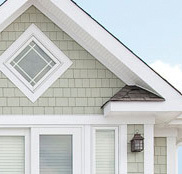 A combination of shingles in gently contrasting shades adds a touch of lightness and charm to this home, and subtly emphasizes its many architectural details. 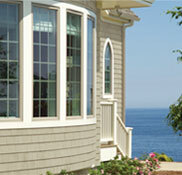 For those who want the rich, natural finish of wood but not the time-consuming maintenance associated with semi-transparent stains, Maibec introduces the new natural tones siding. This warranty covers labor for 5 years and the stain for 8 years. 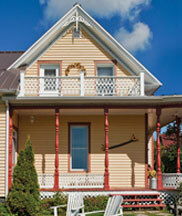 However, applying a fresh coat of stain to the siding between the 6th and 8th year will help maintain its original beauty. 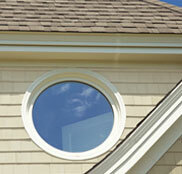 This give a clear advantage over most other semi-transparent products that must be re-stained every 2 to 3 years. Looking for something different? Maibec can match any color – exactly! The TrueMatch® system offerd by Maibec has an endless choice of colors guaranteed to match any color exactly. It’s quick, easy and guaranteed to match! Ask our estimator about it! Introducing Maibec’s “spice” series of shingles. Four eye-catching semi-transparent colors that let the natural beauty of wood shine through - Burnt Ginger, Cinnamon, Nutmeg Brown, Golden Curry. 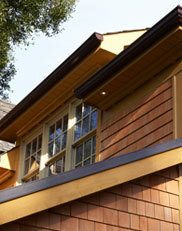 The first semi-transparent shingles protected by a firm 3-year warranty that covers labor!